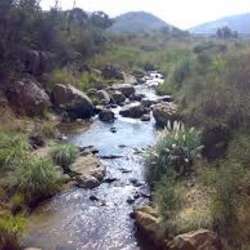 You must be a member of the Johannesburg Outdoor & Adventures Group to attend this activity. Would you like to join this group? Referred to as Jozi’s ‘Jewel of the South’, Klipriviersberg was a nice hike last time we did it, so let's revisit. Yep. That’s us in the photo. I’ve drawn up two routes: one easy (6.1 km) and one moderate (9.3 km). Both groups will start together and then separate after 3.1 km. Both groups set out from Silent Pools and meander into the foothills all the way down to Sarel Marais’ homestead. The easy trail then simply follows the riverbank back on flat terrain, while the moderate track crosses the river and climbs up into the koppies on the opposite side of the valley. This group will rest at a high altitude lookout point offering splendid views. I’ll take the easy route, but bring maps for those wanting the more challenging one. Please bring at least two litres of water, a strong pair of walking shoes or hiking books, a hat, light clothes to avoid overheating, sunblock, an energizing snack, and an emergency plastic poncho in the event of showers. Be or bring a passenger by posting a message below. We have one. Text me on Protected content you'd like to be added.